The simplest tool can sometimes be the most effective. Consider a list of the world’s easiest to use and most beloved tools: a pencil, a ruler, a shovel and the ever-present workhorse in business, education, and daily life—the Post-it note. Developed by accident by Spencer Silver, a senior researcher and chemist at 3M in the late 1950s, his low tack reusable adhesive was referred to within 3M as a “solution without a problem,” since no one could envision a use for the small sticky and movable squares. That was until a colleague, Art Fry, used the removable sticky paper to bookmark a page in his hymnal. Fry, having discovered that the squares could easily be used to mark pages without marring the paper underneath and then repositioned easily, sought to develop the product for commercial usage and the Post-it was officially born. How did we learn just how powerful this simple tool is in the collaboration process? Partnering with Continuum colleagues, over that past two years, we’ve conducted an intensive design-thinking seminar with MIT Sloan MBA students. An important process in the design thinking methodology is team-based iterating to brainstorm ideas focused on solving a client problem such as the one presented this year by the MIT Leadership Center. For many MIT Sloan students the team-based ideation process is a new challenge. Enter a pad of Post-its – where everyone is responsible for penning their unique ideas and posting them to a white board. The result: Students culturally oriented to refrain from participation or those who by nature are introverted gained confidence sharing their ideas, hearing multiple viewpoints and giving constructive feedback. Using post-its created the right conditions for squares to be easily posted, moved, parked or tossed and for team mates to collaboratively engage in revising and vetting to strengthen ideas based on feedback, not intuition. As one student, a managing partner at a Canadian law firm, said, writing down an idea on your own block of Post-it® Notes ‘levels the playing field’ so that regardless of personality style or level of expertise, more people feel comfortable participating. We all know first-hand teams work better when sharing ideas to pursue a common goal. What we teased out of our retrospective session and what leading authors such as Gillian Tett in The Silo Effect clearly expose, getting collaboration right across diverse teams and letting different voices be heard is a constant and rigorous endeavor. Although there is no single blueprint for collaborative success and using Post-it Notes is not a panacea to unlocking incredible ideas, in my experience at the MIT Sloan School of Management, sometimes the simplest, most versatile tool helps a team begin to create an environment of interpersonal trust and mutual respect to optimize innovative problem-solving and thoughtful decision-making. Virginia Healy-Tangney is a Senior Lecturer at the MIT Sloan School of Management. 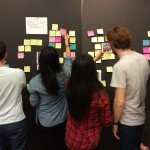 This entry was posted in Uncategorized and tagged collaboration, Continuum, MIT Sloan, Post-It Notes, success, Virginia Healy-Tangney by mitsloanexperts. Bookmark the permalink. This is a great article and I will use this in my next workshop! Hope all is well. We are all pretty disheartened by the results of the election. Diane worked very hard for Hillary in Florida so it is a personal loss for her, although, in her district, Hillary did win. Have a wonderful Thanksgiving.